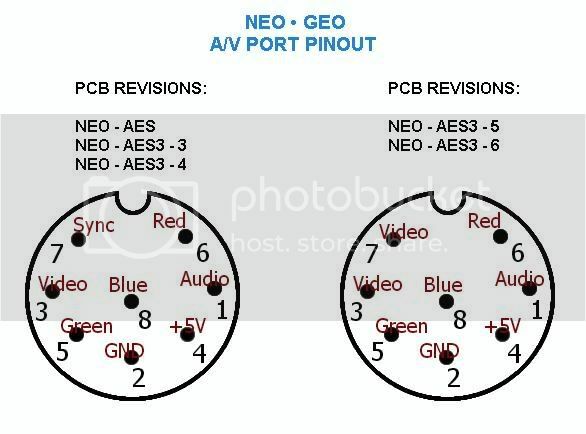 SNK used the same pinout for all their consumer Neo hardware. The Neo, Neo CD (top and front loader) and the CDZ all use the same connector. The CD systems also have AV and S-video outputs that the cartridge system lacks. They are standard connectors and aren't listed here. It should be noted though that the sync output was removed from the last two revisions of the cart system. It should be noted that not all Neo Geo cartridge systems are created equal. Some have better RGB output than others, some have better composite video than others. This is covered in some detail in this NFG Games article. There's more information about this difference in another NFG Games article, showing more technical details about the changes made between revisions.